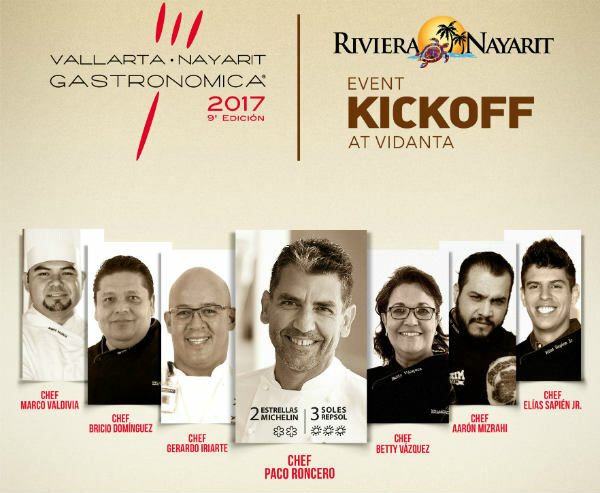 This culinary event featuring seven renowned chefs marks the start of the activities for the 9th Vallarta Nayarit Gastronómica 2017, which will take place in October of this year. The Kick Off Gastronómico Vidanta starring a group of national and international chefs is ready to go for August 14-16 and marks the start of the activities for the 9th Vallarta Nayarit Gastronómica 2017, which will take place in October of this year. Gerardo Iriarte, Executive Chef for Vidanta Nuevo Vallarta, will be hosting this incredible experience. He has over 25 years of experience and has garnered several culinary awards in Mexico, Latin America and Europe. Bricio Domínguez, owner of El Jardín de los Milagros in Guanajuato, who has perfected his recipes to retain the traditional essence of Mexican cooking while showcasing his distinctive style. Betty Vázquez, Culinary Ambassador for the Riviera Nayarit and one of the judges for Master Chef México, is the owner of El Delfín restaurant in San Blas and has made Mexico’s Pacific cuisine fashionable through her exquisite Nayarit dishes. Aarón Mizrahi, Ambassador Chef for Creekstone Farms, is an expert in US beef. He has shared his cuisine with Michelin Star chefs and cooked for them, as well as for high-ranking politicians and celebrities that range from the world’s best DJs to icons of Hispanic music. Marco Valdivia, who has helmed Tepic’s Emiliano restaurant for seven years, and who presents a modern, fresh take on contemporary Mexican cooking with a dash of the traditional cuisine of his home state of Nayarit. Guadalajara’s Elías Sapién Jr. is a banquet professional and will conduct a workshop on specialty dietary requirements such as kosher, vegan, alkaline and celiac, including the theoretical framework and a demonstration of successful dishes and recipes. There will also be several gourmet culinary workshops and premium tastings for demanding palates conducted by Vinos L.A. Cetto and Yamir Pelegrino, one of the best Master Sommeliers, Wine & Cigar, in the world. There will be pairings with L.A. Cetto wines, Tequila Sauza, Moët & Chandon, Hennessy, Bohemia beer and Clinik. The Riviera Nayarit Convention and Visitors Bureau is proud to support this important event, which without a doubt will contribute to the promotion of the Riviera Nayarit and in influx of tourism to the destination, shining an international spotlight on the quality of the culinary offerings that visitors will experience in Mexico’s Pacific Treasure.